Egypt's modern landscape is a sandy desert through which flows the Nile River. It hasn't always been like this. In the Late Cretaceous, this part of North Africa was a coastal zone bordering the ancient Tethys Sea. 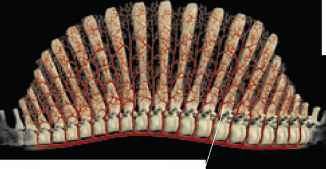 Around 95 million years ago the area was a swampland of shallow tidal marshes, water channels, and tropical forest. This was a good place for turtles, crocodiles, and dinosaurs to live. Spinosaurus—a predator on a scale with Tyrannosaurus rex—caught fish here, and there were enough plants to feed Paralititan, a truly massive sauropod. 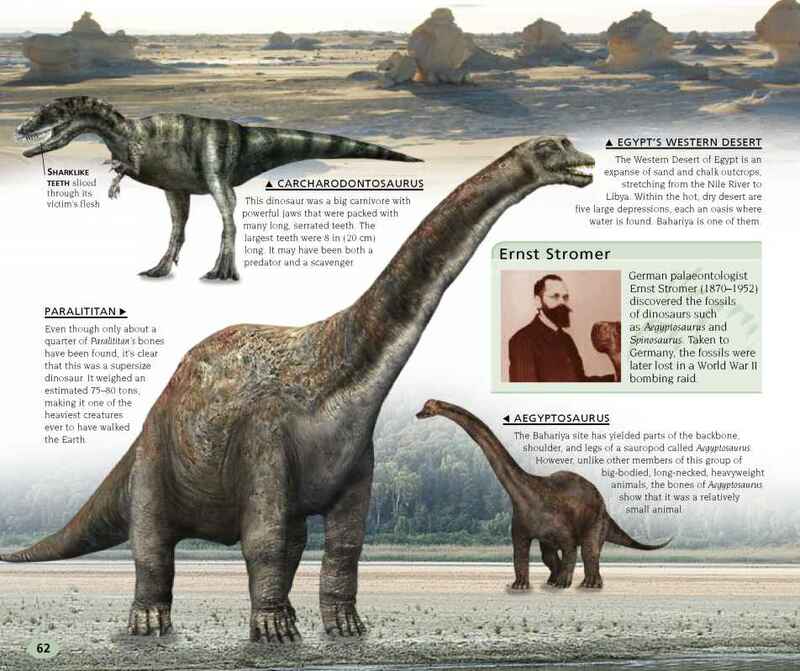 The area where these and other dinosaurs have been found is today's Bahariya Oasis, an island of trees and farms surrounded by Egypt's Western Desert. Bahariya Oasis is 180 miles (290 km) southwest of Cairo. A shallow depression in the desert floor, it measures 58 miles long by 26 miles wide (94 km by 42 km). 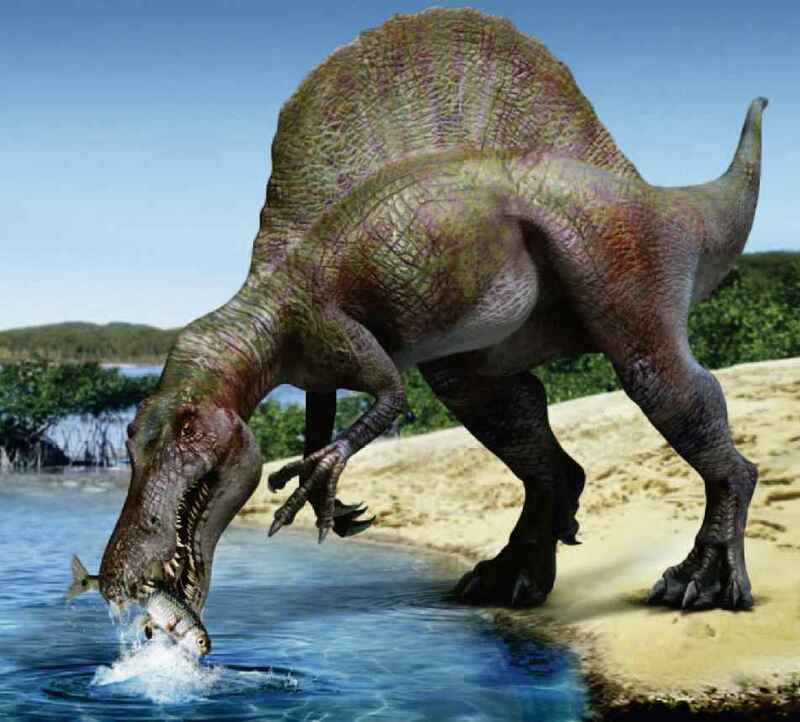 Bigger even than Tyrannosaurus rex, Spinosaurus was a formidable carnivore and was probably the top predator in its area. 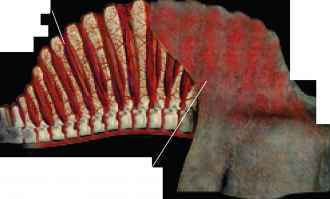 Its long jaws seem to have been designed for catching fish— but it is the curious skin "sail" along the length of its back that is its most striking feature, though its purpose is uncertain. Length: 13 ft (4 m) Pronunciation: hoy-yang-oh-sore-us Meaning: "Huayang lizard"
China has produced the world's best examples of Early Jurassic dinosaurs. However, it is the ones from the Late Cretaceous that have increased our knowledge the most, as fossils such as this Sinosauropteryx are preserved in magnificent detail. 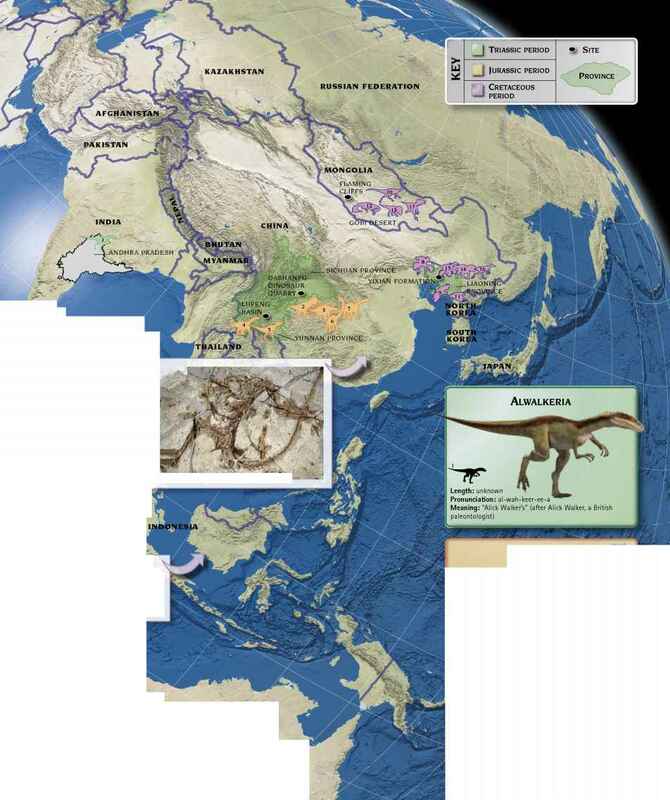 Some of Asia's major fossil locations are shown on this map, together with some of the prehistoric animals found there. Length: 13 ft (4 m) Pronunciation: gas-oh-sore-us Meaning: "gas lizard"
The continent of asia is changing the way we think about dinosaurs. 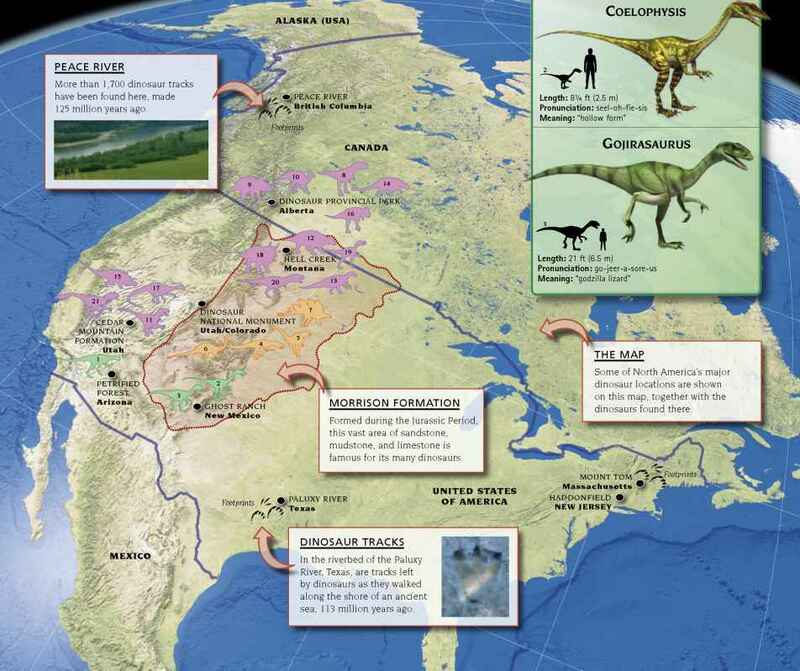 About 275 locations have produced fossil evidence, from the Late Triassic through to the end of the Cretaceous. 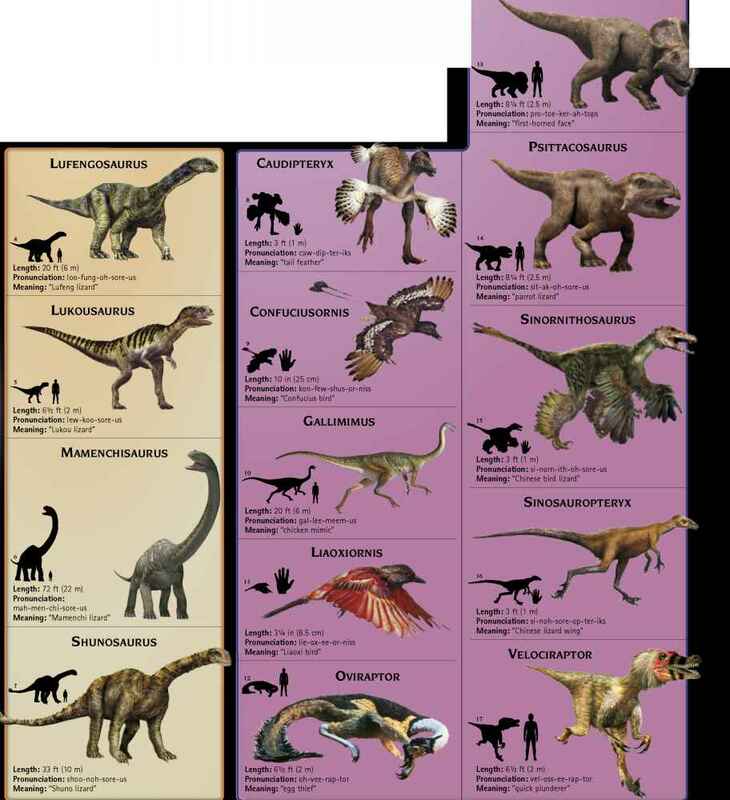 While Triassic specimens are scarce, known only from India and Thailand, evidence for Jurassic and Cretaceous dinosaurs is plentiful. Discoveries from China—of small feathered carnivores such as Caudipteryx—have shown that dinosaurs and birds are related.